With the ’supply’ front of the Mexican Drug War looking grim, Mexico’s Drug-Free World chapter attacks the ’demand’ aspect: cutting off criminals’ supply of users by educating young people on the dangers of doing drugs. Mexico is a country crippled by the global drug trade. Cartels dominate the illicit market, controlling an estimated 70 percent of the foreign narcotics channeled into the United States while wars wage internally for control of lucrative trafficking routes. Meanwhile, the Mexican government’s War on Drugs wages a desperate effort to dismantle the cartels and end their reign of violence. At least 100,000 lives have been lost in the melee, including the murder in September of federal congressman Gabriel Gomez, the most high-profile politician killed by the cartels in recent years. It is a largely futile fight. Corruption destabilizes government and law enforcement in Mexico, with officials at the municipal, state and federal levels bribed or intimidated by cartels to turn a blind eye or, worse, participate directly in the drug trade as conspirators. In a recent case in the western state of Michoacán, mayors of three cities were arrested on organized-crime charges for alleged ties with the Knights Templar drug cartel. 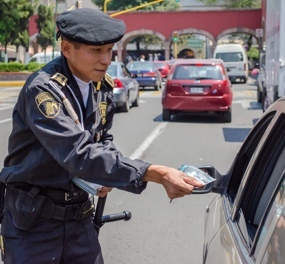 Two thousand Mexico State Auxiliary Security Forces officers, trained on the Truth About Drugs program, have distributed drug education booklets across the state. And now a strategic shift in this illicit economy has dealers operating as wholesalers rather than in the more traditional courier role—taking payment in product, not cash, and making them nearly impossible to track. For the foreseeable future, there will be no shortage of drugs in Mexico. But among those who intend to do something about it are business owners and Scientologists Salomon and Lucy Dabbah of Mexico City. Recognizing that the ultimate answer to the drug scourge is to educate young people to stay away from drugs, the Dabbahs head the Mexico chapter of the Los Angeles-based Foundation for a Drug-Free World. The centerpiece of the Foundation’s work is the Truth About Drugs program and its fact-filled, hard-hitting audiovisual and printed educational materials. The program includes booklets handed out by the tens of thousands that give young people the straight facts, with no scare tactics, covering a dozen of the most commonly abused substances—marijuana, cocaine, prescription drugs, alcohol, heroin and more. “When you speak to someone and give them the truth, rather than the lies they have heard from drug dealers, when you clarify for them what a drug actually is—a poison—their response is incredible. Their minds and their lives can change in front of you,” said Salomon Dabbah. Mexican drug cartels take in between $19 billion and $29 billion annually from U.S. drug sales. Illegal drug use in Mexico rose 87% between 2002 and 2011. The Dabbahs began their personal drug education mission by providing the program and its materials to schools throughout Mexico, including those attended by their 11 grandchildren, who are well-versed participants in the project. In 2011, Salomon and Lucy presented the Truth About Drugs program to attendees at a school safety conference held by the Ministry of Public Security in Mexico City. When the director of Mexico City’s School Safety Police, Commander Lucio Faustino Gómez, saw the program, he knew it was the no-nonsense, fact-driven educational program he needed. Mexico is the primary supplier of illegal opium derivatives to the United States. The U.S. DEA reported a 324% increase in heroin seizures at the Mexican border between 2008 and 2013. From that conference came a formal working partnership of Drug-Free World Mexico and Mexico City´s School Safety Unit (USE-Unidad de Seguridad Escolar), a branch of the state police force focused on drug and crime prevention in middle and high schools. They share the same goal: cut off criminals’ supply of users through education. As the first order of business, 80 School Safety Unit officers were trained to deliver the Truth About Drugs program in middle schools and high schools, using the Education Package from the Foundation for a Drug-Free World: a full semester of lesson plans; the public service announcements “They Said, They Lied,” debunking the common falsehoods told by drug dealers; the documentary film The Truth About Drugs: Real People, Real Stories, high-impact accounts by former users who survived addiction; and sets of the dozen Truth About Drugs booklets. 90% of the cocaine that enters the U.S. transits through Mexico. In a partnership in the state of Mexico, Drug-Free World Mexico has teamed up with Auxiliary Security Forces, responsible for internal security, narcotics detection and protection against drug-induced violence. 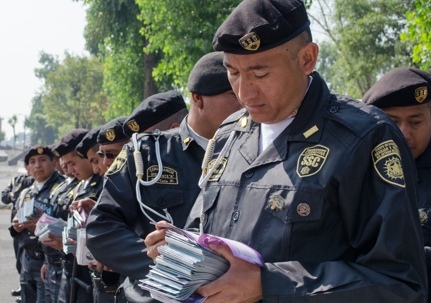 Coordinated by the president of the Mexican Association of Police Instructors, 2,000 Auxiliary Forces officers were trained on the Truth About Drugs program, after which they distributed 30,000 booklets across the state in a single weekend. In April 2014, the Mexico Ministry of Health issued an invitation to Foundation for a Drug-Free World to schedule drug prevention activities in all schools and other youth institutions. The Mexican Red Cross collaborated by mobilizing thousands of volunteers to hand out Truth About Drugs booklets at weekly expos organized by the Ministry of Health. The ministry also provided dozens of its staff each week to do massive distributions of Truth About Drugs booklets at weekly fairs and other venues throughout the city. From the success of these partnerships came a grant from the United Nations Office on Drugs and Crime field office in Mexico to pilot the program in high-risk schools in Mexico City—resulting in presentations of the Truth About Drugs to 37,000 students in 104 schools. All told, Drug-Free World has distributed nearly 250,000 drug education booklets to young people throughout the nation. Mexico is also a main supplier of marijuana and methamphetamines in the U.S. Some 100,000 people have been killed in the Mexican Drug War.